There are several delicious duos in nature, like chocolate and peanut butter or carrots and hummus. But what about a food pair that can help you lose weight, fight off infections and clear up your skin all at the same time? As far as we know, there’s only one culinary combo that can do all that: lemon and raw honey. There’s a reason why so many people love squeezing a lemon in their water. For starters, lemons contain lots of vitamin C, which boosts the immune system to ward off potential infections. Lemons are also a natural stimulant for the digestive system and help to balance the acidity level in the body. And if you’re trying to lose weight, lemon has appetite-suppressing properties to give you a helping hand. If you need more convincing, research has shown that the citric acid in lemons can aid in the removal of harmful toxins from the body and even reduce blood pressure. According to one study published in the Chemistry Central Journal, lemons possess a treasure trove of special properties. Researchers wrote, “Citrus fruits exhibit plentiful bioactivities including antioxidant, anti-inflammatory, anti-cancer, antimicrobial and anti-allergy activities, as well as cardiovascular effect, neuroprotective effect, hepatoprotective effect, obesity control, etc.” We could go on and on about the amazing properties of lemons, but we think you get the picture. A dash of raw honey will add a touch of sweetness to any meal or drink. But unlike processed sugar, raw honey contains natural fruit sugar with a healthier glycemic index (GI). This means raw honey will provide your body with a stable source of energy, rather than a high and a crash.In addition, raw honey is well-known for its antifungal, antibiotic and antibacterial properties. Research shows that consuming honey can protect against gastrointestinal issues, balance blood sugar, fight inflammation, inhibit oxidative stress and more. As long as it’s the good stuff (organic and unprocessed), raw honey will take you far. A lemon and honey mask is great for improving the quality of your skin. The high concentration of antioxidants in lemons, especially vitamin C, has been shown to fight and prevent skin damage caused by free radicals. Vitamin C also supports healthy collagen production, helping you achieve smoother, more supple skin without chemical-filled creams and potions. As for raw honey, it cleanses the skin while also providing some much-needed moisture. The anti-inflammatory and antibacterial properties will easily penetrate the skin and soak up gross bacteria straight from the pores. You can make an all-natural skin mask by mixing equal parts of honey and lemon juice. Apply it to your face and let it sit for 10 minutes. Wash off with warm water and enjoy your beautiful skin! Before you hop into the shower, mix a tablespoon of raw honey with a little warm water to create a natural shampoo. It’ll moisturize your scalp and smell great without leaving your hair sticky. Once you’re out of the shower, lemon juice squeezed onto your scalp can help treat dandruff, bacterial problems and even hair loss. If diluted in water and applied regularly, lemon juice can also improve your hair’s shine. If you want to lighten your hair naturally, add lemon juice to your tresses before you head outside. Hello, highlights! Lemons have 22 anti-cancer compounds, including limonene, which has been shown to stop the growth of cancer tumors in animals. Additionally, lemons also contain flavonol glycosides, which stop the division of cancer cells. A 2005 study published in the Journal of Nutrition found that limonoids can help protect cells from the type of damage that leads to cancer. Raw honey is rocking it in the anticancer department as well. Though honey contains a form of sugar (which cancer cells usually love), researchers have found that honey is a natural immune booster, anti-inflammatory agent, antimicrobial agent and cancer “vaccine” to vastly outweigh any disadvantages. In one meta-analysis, for example, researchers suggested that the inverse relationship between cancer and honey may be due to the inhibition of cell proliferation, induction of apoptosis and cell-cycle arrest. In layman’s terms, the compounds in honey cause cancer cells to die. Lemon and honey can help soothe bug bites and relieve itching. 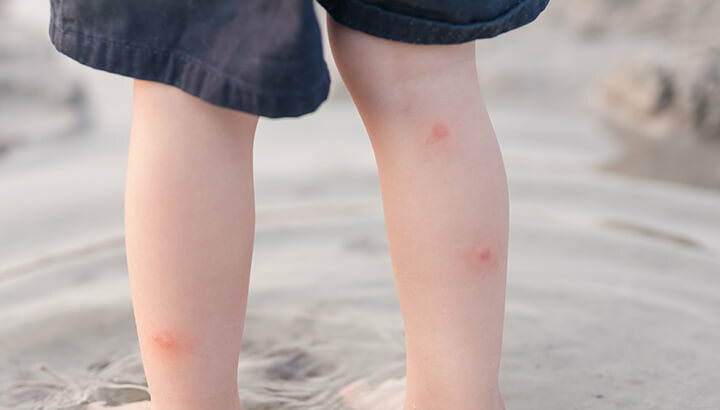 With summer just around the corner, we’re all going to need some useful bug bite remedies. Here’s a good one: Mix some lemon juice with honey to create a natural antiseptic solution. The sugar in the honey will kill the microorganisms and the lemon will prevent the bacteria from taking over. The combination will also reduce swelling and itching — you’re welcome! For best results, squeeze the juice of one lemon into two tablespoons of raw honey, then spread it on the infected area. Keep it on there until you notice the swelling go down and itchiness subside. When you’re under the weather, there’s nothing better than a piping hot cup of water, lemon and honey. This cold and flu remedy has been around for centuries for a good reason. 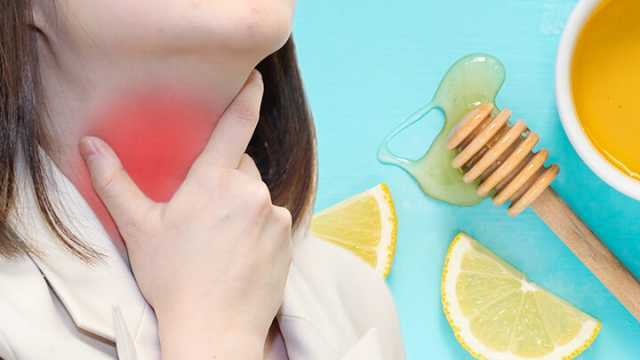 The lemon will work its magic on congestion, serving up 139 percent of your daily recommended value of vitamin C. And forget throat numbing sprays; warm honey will soothe a sore throat, naturally. 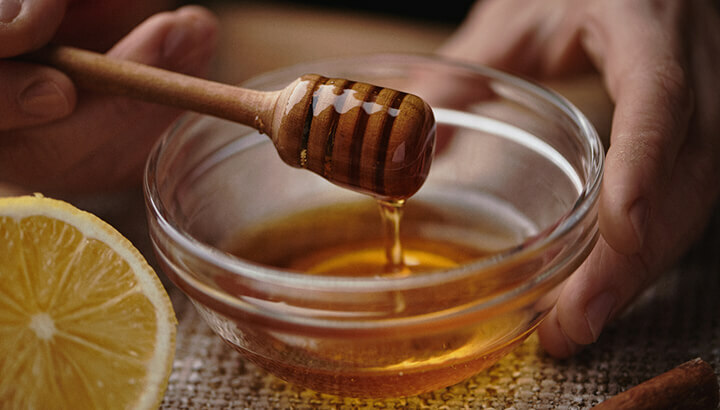 If your cough is keeping you up at night, honey will be your new best friend. In one study, researchers found that a tablespoon of raw honey acted as a natural cough suppressant for children with upper respiratory infections. So, go grab a spoonful for your tea before bed to get some much-needed sleep and help your body heal. Most of us need a little help maximizing our digestion, especially for weight loss. Fortunately, the combination of lemon and honey in water can do just that. To kick it off, the atomic structure of lemon juice is so similar to our digestive fluids that it tricks the liver into producing bile. Bile then assists with moving food through the stomach and digestive tract — in other words, it’s smooth sailing. Additionally, the antimicrobial properties and vitamin C in lemon juice can help reduce any infections in the gut. Although lemon juice creates acidity in the stomach to help break down food, it has an alkalinizing impact on blood and other tissues to improve immunity. And we can’t forget about honey. The rich, raw stuff contains prebiotics, which acts as fuel for healthy bacteria in the lower digestive system. Because it does not ferment in the stomach, honey is known to fight nausea and indigestion as well. How do you make lemon honey water? 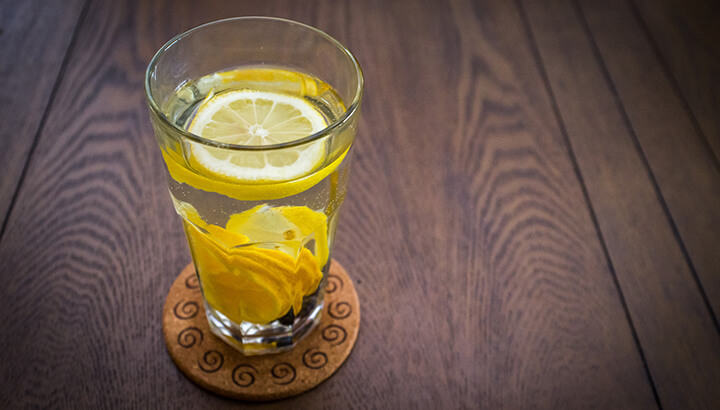 Lemon and honey water can improve digestion. First of all, you should always drink your water at room temperature in order to boost your metabolism and improve your body’s ability to absorb nutrients. You can also boost the value of this recipe try adding 1/2 teaspoon of turmeric, 1/4 teaspoon cinnamon and a dash of cayenne pepper. Once your water is room temperature (or even a little warm), mix in the lemon juice and raw honey. For two weeks, consume this drink three times a day 30 minutes before a nutrient-rich meal. Following the initial two-week period to get your digestive system on track, consume this drink once a day before breakfast. The benefits of lemon honey water are numerous but there are still a few side effects worth noting. For example, too much lemon juice in a day could lead to tooth erosion, heartburn or an upset stomach. To avoid this, we always recommend diluting lemon juice in water. In addition, infants younger than 12 months or people with a compromised immune system may not want to consume raw honey. It could cause a form of food poisoning called botulism, which results in muscle weakness and breathing problems. And, if you’re allergic to bees, please stay away from honey until you’ve been given the green light by a doctor. The next time you’re in the grocery store, skip the processed honey in the little bear bottles — chances are it’s not even the real deal. After testing 60 jars of honey, researchers from Texas A&M University found that 77 percent of supermarket jars and 100 percent of drugstore jars contained no pollen at all. These pollen-free products were ultra-filtered to remove all the good things that make honey, well, honey. Here’s the good news: Organic honey is produced without antibiotics or pesticides on the bees. Organic beekeepers also allow their bees to naturally forage for pollen in the local area, providing major benefits to the flora and fauna near your home. Always support local honey producers! Organic, local honey is better for the bees, the environment and your health. Hey Buddy!, I found this information for you: "6 Benefits Of Lemon And Honey". Here is the website link: https://www.thealternativedaily.com/benefits-of-lemon-and-honey/. Thank you.